The most mentioned among other PR-agencies during autumn 2009 was Publicity Creating Company (265 references in publications). ELVISTI Information Center conducted monthly analysis of online media publications that contained names of PR-agencies operating on Ukrainian PR-market. This research was held during September till November 2009. The most mentioned among other PR-agencies during autumn 2009 was Publicity Creating Company (265 references in publications). The difference between the first and the second place is over 100 publications. It should be noted that Publicity Creating Company was among three media leaders during the research. 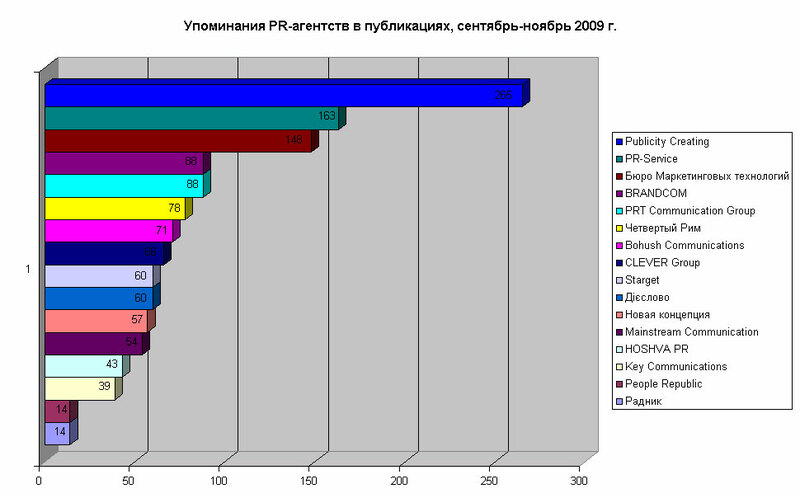 Publicity Creating Company remains the most mentioned on Ukrainian PR-market during the autumn season, as well as throughout the 2009. This is due to systematic information activity, including reports about concluded agreements with partners and customers, PR-campaigns and press-events, as well as implementation of new services. The CEO of the company also participated in various events and commented in mass media the situation and trends of the PR-market.